Rev. 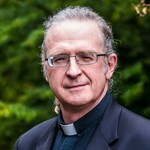 Dr. Robert Allore, SJ arrived at St. Mark's Parish, St. Mark's College and University of British Columbia in January of 2012 after a decade on the campus of the University of Toronto. His university studies began in biology at the University of Ottawa. Upon completion of his studies in Ottawa, he moved to the University of Toronto where he obtained a PhD in Immunology. After several years of research activity, he joined the Society of Jesus (Jesuits) and was ordained to the priesthood in 2001. Before moving to Vancouver, Fr. Rob worked for several years at the Samuel Lunenfeld Research Institute, Mount Sinai Hospital investigating the genetics of nervous system development. During those years he also assisted the Catholic chaplain at the Newman Centre, University of Toronto. Fr. Rob is the pastor at St. Mark's Parish and he is honored to be associated with the young and growing parish of St. Mark's and the Catholic chaplaincy at UBC. The Science and Faith Reflection group, which meets throughout the academic year, is one of his favourite projects at St. Mark's.